In February of 1910 the tribal population of the princely state of Bastar in eastern India rose in rebellion against a small British force stationed within the kingdom. This event, referred to as bhumkal (earthquake), established Bastar as a major battleground for tribal (adivasi) revolt during the colonial period. Almost exactly 100 years later, in one of the deadliest Naxal attacks in recent times, hundreds of Maoists ambushed and massacred at least 25 CRPF personnel in Chhattisgarh’s Sukma district, South Bastar region and escaped with their AK-47 assault rifles. The puzzling fact about Bastar, however, is that unlike so many other regions of India beset by tribal conflict, it never came under the direct control of the British during the colonial period. The former Bastar kingdom is located in the state of Chhattisgarh. During the British period Bastar was over 13,000 square miles, or roughly the size of Belgium. It had a population, in 1901, of 306,501. Adivasis constituted the largest segment of the population, and Gonds were the major tribe inhabiting the area. The state was governed by a lineage of Hindu kings who were not adivasis themselves but Rajputs. The founders of the Bastar state were, according to legend, driven from their former home in Warangal by Muslim invaders in the fourteenth century. They then settled in Bastar and became high priests of the goddess Danteshwari, whom the tribes of Bastar worshipped. The princely state was known for its unique celebration of the Dasera festival. The raja is ‘abducted’ by tribals on the eleventh day of Dasera and then returned to the throne the next day, a ritual that symbolizes the close linkage between the adivasis and their king. During the pre-colonial period, Bastar had been incorporated as part of the Mughal and then Maratha Empire. Due to its rough terrain and geographical inaccessibility, however, it always retained a certain level of isolation—Deputy Commissioner of the Central Provinces and Berar Wilfrid Grigson remarked that Bastar was a ‘backwater in Indian history’. The entire region is one of the most heavily forested areas in India (it is the site of the Dandakaranya forest), and colonial officials often referred to Bastar as one of a number of ‘jungle kingdoms’. When the British finally broke Maratha power in central India in 1818 they subsequently began to enter into a political relationship with Bastar (a former tributary state of the Marathas), and in 1853 the kingdom officially came under the system of British indirect rule. Bastar State was included as part of the Central Provinces administration. and heavily interfering in succession to the throne—that is, removing rajas and replacing them with compliant officials. A more likely cause of intervention was the fact that Bastar had extremely large iron ore deposits, as well as other precious minerals, timber, and forest produce. Over time, British influence in Bastar increased—beginning first with forest administration—due to efforts to appropriate its natural resources, and by 1876 colonial administrators effectively governed the state, the raja ruling in name only. In March of 1876 a disturbance broke out at Jugdalpur, the origin of which has never been quite satisfactorily explained. The immediate occasion of the outbreak was the Raja’s setting out for Bombay to meet . . . The Prince of Wales. The people assembled in large numbers and compelled him to return to Jugdalpur. Their ostensible demand was not that he should not go, but that he should not leave behind the then Diwan Gopinath Kapurdar (a Dhungar, shepherd by caste) and one Munshi Adit Pershad (a Kayeth in charge of the Raja’s Criminal Court), whom the people charged with oppression . . . They simply demanded that the two men mentioned above should be sent away. ‘Relations between Raja and subjects generally [were] good, very good.’ Commissioner Jones also noted that ‘the insurgents committed no violence and professed affection for the Raja’. At worst, the adivasis were upset with the raja’s choice of appointees. But another central cause of the disturbance was creeping British influence in the state—for example, Jones made sure to note that the adivasis earlier in the year had reacted very negatively to new Christian missionaries who had arrived in the kingdom. A number of new colonial policies combined to create a rising sense of embitterment among the tribal population. In the second week of February we first heard of the unrest among the Aborigines south of Jagdalpur. Vague rumours were afloat but none of a very serious nature. On the 18th a Christian living among the Prajas—Aborigines—came to me with the story that the Prajas were all armed and were moving toward Keslur, where the Political Agent, Mr. E. A. De Brett, I.C.S., was camping, to make known their grievances . . . A branch of a mango tree, a red pepper, and an arrow were tied together, and sent to all villages in the State. The mango leaves stand for a general meeting; the red pepper, a matter of great importance is to be discussed and that the matter is necessary and urgent; the arrow, a sign of war. The entire state rose in revolt and the existing British force of only 250 armed police was quickly overwhelmed. For weeks looting, robbery, and arson plagued the entire kingdom. By the end of February additional troops from Jeypore and Bengal had arrived and the rebellion was finally put down. Hundreds of prisoners were taken, including Lal Kalendra Singh, who was expelled from the state and later died in prison. The British conducted several inquiries into the causes of the 1910 rebellion. De Brett also conducted an inquiry on the rebellion and discerned 11 main causes, ranking chief among them ‘the inclusion in reserves of forest and village lands’. Prior to colonialism, the rajas that ruled Bastar did not reserve forest lands, giving adivasis almost unrestricted access to these areas. Alfred Gell notes that prior to the arrival of British administrators ‘the tribal population [in Bastar] enjoyed the benefit of their extensive lands and forests with a degree of non-exploitation from outside which would hardly be matched anywhere else in peninsular India’. Nandini Sundar similarly highlights that prior to British rule there was not even a recorded forest policy for the kingdom. The colonial state began reserving forests in Bastar in 1891, especially areas rich in various kinds of forest produce. This meant timber most of all, but also a class of items known as non-timber forest product, which included rubber, medicinal plants, berries, and tendu leaves, used for rolling tobacco. Due to this new reservation policy, entire adivasi villages in reserved areas were forcibly moved by colonial authorities. Corporations, like those involved in the timber trade or iron mining, entered areas where adivasis had lived and were granted a monopoly right over forest produce. Once a forest area was officially reserved, adivasis no longer had any claim to these lands and were charged fees for collecting produce or grazing in these areas. All of the contemporary reports pointed to the same causes— foremost, new forest policies that displaced adivasis from their land. The main participants in the 1910 rebellion were from areas that suffered the most under new colonial land revenue demands. Despite the admission to an ‘overzealous’ forest administration, British policy in Bastar did not change substantially in the wake of rebellion. They continued to sign various forest mining agreements or renewals of previous agreements—in 1923, 1924, 1929, and 1932. The 1923 agreement, for example, renewed a licence for Tata Iron and Steel to mine Bastar’s ‘enormous reserves of iron ore’. ‘Most of them [adivasis] dislike the proposals for forest reservation . . . However if these areas are not reserved it will be impossible to reserve any good teak forests in the Zamindari. (It is a most unfortunate fact that the best teak areas and the thickly populated, well cultivated Maria [Gond] villages coincide). I am not altogether clear what is meant in this case by guardianship . . . It would, however, be of assistance to me and my successors if our position could be defined. It is certainly an unusual and somewhat delicate one, for normally when a Chief is a minor his father is dead. It is her [the Maharani’s] desire that Profulla should have the title of Maharaja and that he should share her role as Ruling Chief, being co-equal with her and succeeding her as Ruler in the event of her death before him, her son not succeeding to the gaddi [throne] until his death. First of all the Mahjis told Prafulla that they had confidence and trust in him and that he was their ‘mabap’ [mother and father]; to this he replied that he could do nothing for them, that he had no powers. He was willing to do anything for them but . . . he could do nothing. Even before the death of the maharani in 1936 there had been a movement to install Prafulla as the hereditary raja, in ‘joint rulership’ of Bastar with his wife; later came an attempt to at least establish a council of regency and make him the regent. Both movements were squashed by the British. They believed that Prafulla was responsible for several anti-British pamphlets that had appeared over the past several years in newspapers throughout India. Administrators noted, however, that ‘there is no actual proof as the printer’s name is absent from the pamphlets’. The British eventually even removed Prafulla as the guardian of his children and deemed that he should not be allowed to enter Bastar State. The British found fault with almost all of the occupants of the throne of Bastar, and managed to have them removed from power in order to clear the way for direct colonial administration of the kingdom. Lal Kalendra Singh was removed as diwan because colonial authorities came to realise he was ‘totally unfit to be trusted with any powers’. Rudra Pratap Deo was a ‘very weak-minded and stupid individual . . .considered unfit to exercise powers as a Feudatory Chief’. Prafulla Bhanj Deo was an agitator, unstable, and needed to be kept away from his own children. And by the dawn of independence, colonial administrators were already beginning to have serious doubts about the abilities of his son, Pravir Chandra, who was heir to the Bastar throne. Pravir, King of Bastar was the first Oriya ruler and 20th Maharaja of Bastar state who was killed in 1966 by then Congress government of Madhya Pradesh for championing the cause of his subjects. He fought for rights of the tribal people. He represented Jagdalpur Vidhan Sabha constituency of undivided Madhya Pradesh Legislative Assembly by winning General election of 1957. He was the last ruler of the Kakatiya Dynasty of Bastar. The colonial history of Bastar after the mid nineteenth century featured British officials taking control over forest lands, displacing tribals, and finding ways to govern the state directly rather than through native rajas supported by the local population. All of these factors increased unrest among the adivasis of Bastar and led to two tribal rebellions against British rule. British colonial rule in India precipitated a period of intense rebellion among the country’s indigenous groups. Most tribal conflicts occurred in the British provinces, and many historians have documented how a host of colonial policies gave rise to widespread rural unrest and violence. In the post-independence period, many of the colonial-era policies that had caused revolt were not reformed, and tribal conflict continued in the form of the Naxalite insurgency. Why the princely state of Bastar has continuously been a major centre of tribal conflict in India? Why has this small and remote kingdom, which never came under direct British rule, suffered so much bloodshed? There are two key findings that explain the above questions: first, that Bastar experienced high levels of British intervention during the colonial period, which constituted the primary cause of tribal violence in the state; and second, that the post-independence Indian government has not reformed colonial policies in this region, ensuring a continuation and escalation of tribal conflict through the modern Naxalite movement. Along these lines, scholars have shown how new colonial policies, such as the commandeering of forest lands and increased rural taxation, led to widespread discontent and rebellion among indigenous groups. Eric Stokes notes, for example, that ‘resentment against [moneylenders] boiled over most readily into violence among tribal people like the Bhils, Santals, and . . .the Gonds’. Historians have also shown that after independence, the new Indian government did not reform a number of colonial-era policies, especially those dealing with forestry, and tribal conflicts continued to occur throughout the country, especially in former areas of direct British rule like Bengal, Bihar, and Jharkhand. 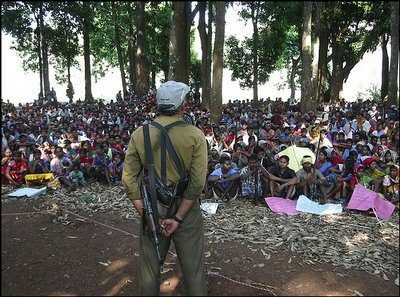 These decisions in Bastar led to the rise of the contemporary Naxalite insurgency, which is only the latest incarnation of tribal unrest in the region. The case of Bastar, therefore, reaffirms the central role of British colonialism in producing tribal conflict in India by showcasing its effects even in areas that never formally came under the ambit of direct rule. Importantly, however, the continuing violence in Bastar concurrently implicates the post-colonial government in failing to end the root causes of the bloodshed.